Ever thought being a mother of four kids under five was a bit daunting? How about throwing a full time job in the mix? And what if that full time job was to present the weather bulletin to Regional Victoria for Nine News every night of the week… impossible, right? Well, not for Sonia Marinelli. 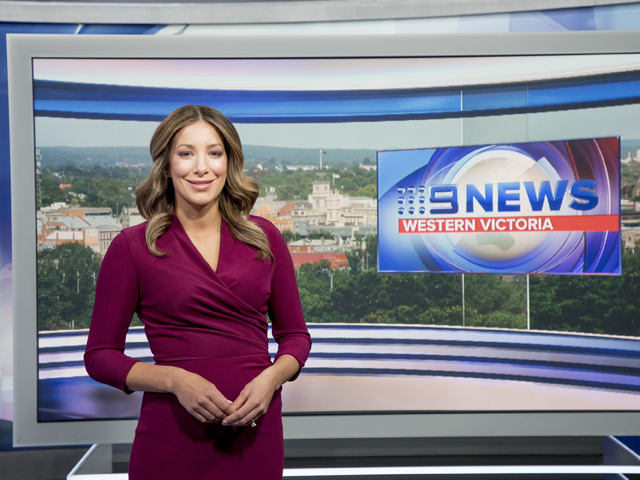 Returning back to work after having her fourth, beautiful baby girl Vivienne, only three months ago, the superstar mum is back on screens around Regional VIC and more enthusiastic than ever before. For Sonia, it's all about the balance between work and personal life, being able to switch off at the right times and living in the moment. Question: What were the biggest challenges you faced when returning to work post-pregnancy? Sonia Marinelli: The biggest challenge I have found this time around was returning to full time work so early. My youngest Vivienne was just three and a half months old, so leaving her five days a week was the biggest challenge. I am very lucky with my hours though- starting at midday I have my mornings with the kids before they go into care, and I am home in time to eat dinner with them. But other than that, it's been pretty straight forward; going from three to four kids hasn't made much difference to our lives. It's organised chaos which I absolutely love. Question: How do you juggle four kids with work commitments? Sonia Marinelli: It takes an army. It wouldn't happen without the support of my incredible husband. We share the caring of the children evenly. I do the morning and the drop offs, he does the afternoon pick up, and we do the evenings together. I also have my parents who care for them a day week and are always there to call on if we need. Mum also folds all my washing when she's over so that's a God send. As you can imagine we go through a lot of clothes! Question: Do you have time for a social life? Sonia Marinelli: My kids are my social life. My world away from work revolves around them. Sure it's nice to be on my own every now and then, but really I wouldn't know what to do with myself. They are my everything and keep me entertained. And besides, going to work allows me to socialise with adults and feel independent for those hours, so all my free time is dedicated to my kids and there's always time for a cuddle with my husband on the couch! Question: What advice do you have for other mothers returning to work post-pregnancy? Sonia Marinelli: If that's what you want, you can make it happen. Be motivated, be organised and you can achieve it. But it's not for everyone, my husband and I both working full time with four kids under six works for us. But I know for sure it's definitely not everyone's cup of tea. Question: How have you created your own work/life balance? Sonia Marinelli: As best as I can, some weeks are better than others and one or the other has to give. I have always prioritised exercise after birth but this time around there hasn't been much time for that. Although it's very rare that I get to sit down these days, so I guess that's incidental exercise which surely counts! Question: What do you enjoy most about going to work? Sonia Marinelli: Using my brain in a way that I don't at home, which is helping to cure the severe case of baby brain I've developed over the last five years. Also, socialising with adults and I won't lie, getting dressed up and spending an hour in the hair and make-up chair is a great post-baby confidence boost! Sonia Marinelli: The best thing about being back at work is having a solid routine again. So I get up early, cook the kids breakfast, feed the baby, get on top of the house, pack their bags for the day and spend some time playing. Then I drop them off to their carers house. Then it's off to Channel 9, straight into the hair and make-up chair.'.. then into the day's prepared outfit... before spending the afternoon writing and preparing four Victorian weather bulletins for Nine Victoria Regional News. I'm in studio recording until after 5pm, and as soon as I'm finished, I get changed and head on home to the family. My husband picks up the kids and is already preparing dinner when I get home. We eat together, then it's bath, book and bedtime. I usually spend a couple of hours tidying the house and prepping for the next day. And after that, my favourite time, spending some quiet time with my husband; before we get up and do it all again! Phew!